Brother Didace was the first child born at Sainte-Anne-de-Beaupré, or at least the first child whose baptismal certificate is inscribed in the parish register; he was also the first Canadian-born Lay Brother of the first missionaries in New France, the Recollets (French Franciscans), and the first Canadian who left a reputation of sanctity on Canadian soil after his death. Such are the titles of Blessed Brother Didace, originally Claude Pelletier. Blessed Brother Didace was born on June 28, 1657; his parents were Georges Pelletier and Catherine Vanier, from Dieppe, France. His life was not eventful exteriorly, and can be summarized in a few words. As a little boy, he was sent to the apprentices' school established by Bishop de Laval at Saint Joachim, not far from Sainte Anne de Beaupré. There he learned the carpenter's trade, in which he excelled. After a childhood and youth spent in labor, piety and love of innocence, he entered the Recollets at Quebec City in the autumn of 1678, at the age of twenty-one. 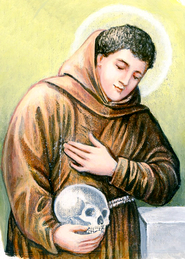 He was clothed with the Franciscan habit in 1679, and received the name Didace in honor of a Spanish Saint, the patron of Lay Brothers; he made his religious vows one year later, in 1680. Brother Didace lived at Our Lady of the Angels mission in Quebec City for another three or four years. Because of his talent as a carpenter, he had a large part in the construction work which the Recollets of that time were undertaking. He was sent to Ile Percé and Ile Bonaventure in the Gaspesie, or eastern shore of the peninsula (1683-1689), to Plaisance, in Newfoundland (1689-1692), to Montreal (1692-1696), and finally to Three Rivers, Quebec (1696-1699). It was in this last city, while doing carpentry work at the Recollets' church, that he contracted a fatal case of pleurisy. Brother Didace was rushed to the Ursulines' hospital; there he requested the last Sacraments, despite the opinion of a doctor who declared him in no immediate danger. After participating in the prayers for the dying, he expired on the evening of February 21, 1699, a Saturday. He was forty-one years old; his last twenty years had been spent with the Recollets. Magnificat magazine, No. 4, April 1991 (Editions Magnificat: St. Jovite). If you forgive men their offenses, your heavenly Father will also forgive you your offenses.